As always we received tons of marvellous questions this week! Unfortunately we ran out of time after answering just two! I don’t know if would consider these to be the best engineered, but they are the best produced and are super creative. – This is not a top ten in any order. The one that jumps out to me and think it was released in the early 2000s, is the My Chemical Romance – The Black Parade album. I remember the first time I heard that album and thinking “wow this band have been listening to Queen.” It had all the things I love, it had a big production but it never got crowded. It was big and exciting, I really absolutely love that record. – I think that record is a masterpiece of production. Is an absolute masterpiece, Herbie Hancock has been a big discussion point over the last couple weeks with having Michael Beinhorn here. Herbie Hancock for me is the glue that holds everything together in the world of Jazz and Rock. When you think of everything he did with Miles Davis and as futuristic as Future Shock got to be. Then there he is doing an album of Joni Mitchell’s songs after Joni Mitchell did an album of Charles Mingus’ songs back in the 1970s. That was an amazing album. Ok, this is a little bit of a contentious one, I think people will fight about the idea of how it was engineered, But production wise and the splash this album made is pretty significant if we’re staying in the last 20 years. I’m actually not the worlds biggest strokes fan, but you’re asking about production and engineering, it sounds like a New York band. I love the guitar playing, love where they have the interweaving guitar stuff. To me it was really a brilliant piece of production because it had sound, a really identifiable sound. It didn’t have huge Hi-Fi, low-end and huge 20K sizzle on top it sounded very narrow, it was very very stylized in a really cool way. So for production, and I suppose the engineering had a lot to do with it as well, it’s a really really important record. – It brought a lot of people together. Ok, so we have done a rock, Jazz, Alternative Indie-ish album, this one is a very very important album by a very very important artist. This was a pretty awesome record, Salaam Remi had done the album Frank before this which was a masterpiece, and showed the beginnings of this english girl who had this Jazzy quality to her without sounding old fashion. She didn’t sound like she was mimicking, she literally sounded 100% believable. When Amy Winehouse sang I believed that’s who she was, everything made perfect sense, it didn’t have that contrived “I’m trying to be jazzy” thing that some singers do – So I believed her. That sort of pain that she had in her voice was born out of her very brief life and her eventual death as well, this record is unbelievably phenomenal. Those guys Salaam Remi and Mark Ronson managed to pull out the classic cocktail area jazz in some ways the 50’s and early 60’s meet classic soul and R&B. It has class written all over it with capital letters. It’s a classy sounding record, nothing contrived about it at all, you just believe every single note that is sung and played in that record. This one to me is a no brainer! The gorillas are incredible, I have seen them a countless amount of times, it’s one of the best shows you will ever see because no stone is left unturned, Rock one minute, Rap the next its Hip-Hop in the middle, it’s EDM, it’s Acoustic, Piano-driven, it’s whatever. It never loses your interest and that sums up demon days, the first time I heard Demon Days, I thought “What is this” and I just loved it. Every song is hooky, the production is really exciting it hits on all levels, and I don’t think it’s ever going to be dated. I’m going to miss out on great records, cause you’re asking me to name 10 so these are just the ones that spoke to me and you can have 10 different ones. 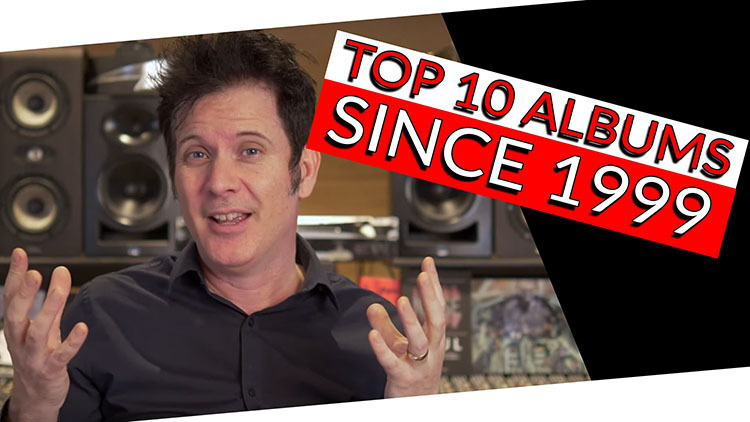 Watch the video below to find out why these 5 albums made it into my top 10. • What are your top 10 best Engineered/Produced Albums of the last 20 years? • If you had to start all over again, what Mic preamp and compressor would you buy?